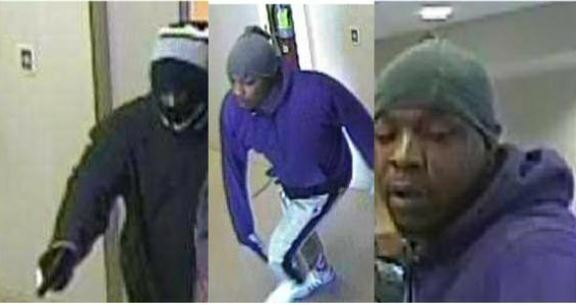 On May 9, 2018, at approximately 10:15 A.M., two suspects entered the Capital One Bank located at 5310 Forest Lane. The suspects entered the location armed with handguns demanding money from the bank employees. Suspect #1 jumped over the teller’s counter and demanded money from the bank employees at gun point. Suspect #2 forced the bank employees seated in the lobby to walk over to the teller’s counter. The suspects fled from the location through the back door with an undetermined amount of money. Black male, mid 20’s, 6’0” to 6’1”, 200 lbs wearing a purple long sleeve hoodie, gray cap, and white sweatpants, armed with a handgun. If you have any additional information concerning the suspect or offense please contact the Dallas Field Office of the FBI at (972) -559-5000 or, the Dallas Police Department Robbery Unit Det. Winn at (214) 797-0296.